The marine currents basically set the pattern for the Galapagos Islands weather. The "garua" season June to December is influenced by southern currents coming along the west coast of South America. Engines: 2YAMAHAS 4 strokes 200HP ea. 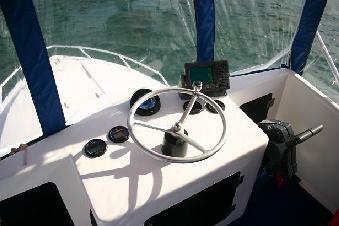 Very spacious cockpit with ample room for fishing, snorkelling, diving, or just relaxing. With an innovative design, the 31' Megapacific is a very good boat option for small groups of up to 4 anglers. Its wide, open social areas offer good resting areas with plenty of seating plus a mini cabin at the bow. 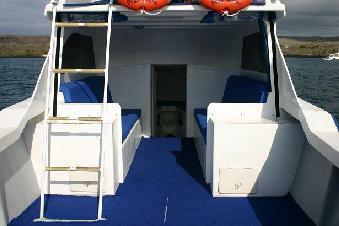 Outside, the cockpit is very large with plenty of room for fishing in the Galapagos. Solid fiberglass deep-v hull with wide beam. 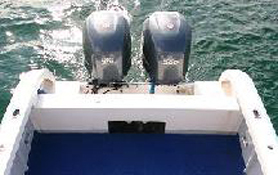 Twin 200hp 4 stroke new YAMAHAS will cruise the boat at around 25 knots, just perfect for your Galapagos fishing adventure. 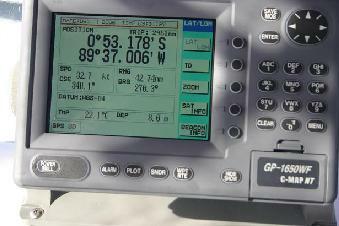 As part of the navigational equipment we count with a 3 in 1 Furuno GPS - Fish finder and echo sounder. All security equipment neccesary to ensure your safety on the trip. In accordance with the sport fishing laws in the Galapagos, our guides and captain include locals who have been performing this activity as a means of survival for the past 25 years. 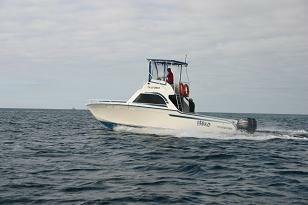 This allows the captain to take you to the best fishing spots. Also, an English speaking naturalist guide licensed by the Galapagos National Park is available to share his knowledge about the waterlife. As part of the fishing equipment we count with brand new Penn rods and Shimano reels , lines ranging from 20# , 30# , 50# , 80# , Two fly rods. You will find all the necessary tackle on board, and of course you are more than welcome to bring your favorite equipment.